Republican nominee Donald Trump, like all Republican politicians, place our veterans on a pedestal and use appeals to shallow nationalism to convince his followers that he somehow cares for this nation and our military. But Trump’s recent statements show that the draft-dodging mogul cares absolutely nothing for well-being of our fighting men and women, just as he cares nothing for anybody not named Trump. In an exchange missed by most of the media, Trump today insulted all of our veterans who have suffered psychological trauma during their overseas tours by saying that only weak soldiers suffer from PTSD, and that therefore our “strong veterans” don’t require psychological counseling when they return home. When asked how he would approach mental health issues such as PTSD and if he would support spiritual counseling for veterans affected by them, Trump implied that veterans who are “strong” don’t suffer from such afflictions. So, in Trump’s mind, only “strong” veterans don’t get PTSD – therefore anyone who does is “weak.” This is probably a bizarre line of thinking that he will try to link to his efforts to privatize veterans’ care (which is strongly opposed by veterans groups), but it also reveals the callous disrespect for the struggles our military men and women go through – a disrespect which has by now become a running theme throughout his campaign. As low as 11% and as high as 20% of our veterans suffer from post-traumatic stress disorder, which is an extremely serious mental affliction that can affect anyone exposed to trauma. Donald Trump, having never faced a situation he couldn’t buy his way out of, has no conception of what sacrifice or trauma truly is. A child of a golden spoon who’s had everything in his life handed to him, Trump’s disdain for the struggles of our veterans is disgusting, and is just more proof that he would be an atrocious commander-in-chief. Sun Tzu, the world’s oldest recorded strategist, wrote that one must “treat your men as you would your own beloved sons, and they will follow you into the deepest valley.” Trump doesn’t treat our fighting men and women with any more respect than he does the workers in his hotels or the women on his television shows, and it’s obvious that our fighting men and women won’t follow him anywhere after these comments. 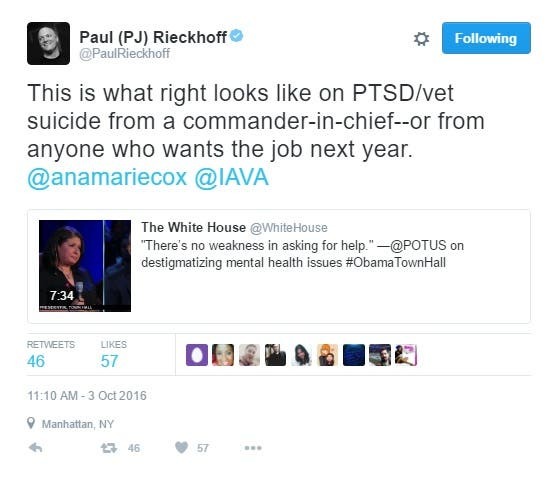 PJ Reikoff, the CEO of the Iraq and Afghanistan Veterans of America, responded to Trump’s comments with this spot-on comparison with President Obama. How dare @realDonaldTrump tell me I or my Marines couldn't handle it. I'm shaking.